Is just around the corner! SAB runs February 1 through March 31. Click the picture above to download the brochure. Those of you who are current customers should be receiving yours VERY SOON in your mail box! 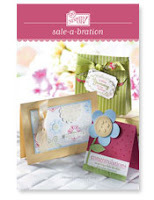 This years SAB products include 4 stamp sets, a ribbon bundle & a pack of Designer Series Paper! Of course they all coordinate wonderfully!! As usual, during SAB, customers have the choice of a free item from the brochure for every $50 they spend on catalog merchandise. Hostesses get to choose a free item with each $300 in workshop sales. And new demonstrators who sign up during SAB get to choose ANY set FREE (value up to $47.95) from the Spring/Summer Idea Book and Catalog. Yes, I said ANY set FREE when you sign up. What are you waiting for??? Well, other than February 1st! The starter kit is an excellent value everyday at the price of $199, but this makes it an especially good deal! And all your future purchases are at a discount! Contact me if you need more information! We can have you signed up in a matter of minutes through my demo site. Here is a sample I created for a recent swap, using the Congrats & Polka Dot Punches SAB sets, the Ribbon Bundle, & the Delicate Dots DSP. The card base is So Saffron. I stamped the 'congratulations' in Certainly Celery at the bottom of the Saffron. 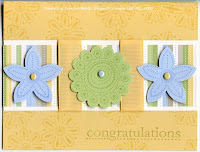 I stamped the smaller flower from the Polka Dot set on the background in Saffron. I layered the stripe piece of DSP on Whisper White and attached the Saffron ribbon . The punched images were stamped on textured CS, Certainly Celery on Certainly Celery & Bashful Blue on Bashful Blue. Brads were added to the center and images attached with a dimensional.